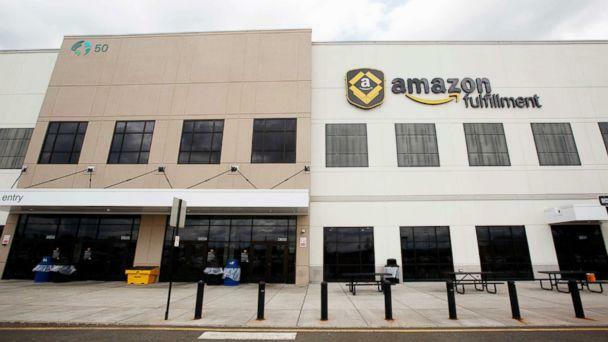 Twenty-four Amazon workers in New Jersey have been hospitalized after a robot accidentally tore a can of bear repellent spray in a warehouse, officials said. The two dozen workers were treated at five local hospitals, Robbinsville Township communications and public information officer John Nalbone told ABC News. One was in critical condition while 30 additional workers were treated at the scene. The official investigation revealed "an automated machine accidentally punctured a 9-ounce bear repellent can, releasing concentrated Capsaican," Nalbone said. Capsaicin is the major ingredient in pepper spray. “Today at our Robbinsville fulfillment center, a damaged aerosol can dispensed strong fumes in a contained area of the facility. The safety of our employees is our top priority, and as such, all employees in that area have been relocated to safe place and employees experiencing symptoms are being treated onsite. As a precaution, some employees have been transported to local hospitals for evaluation and treatment,” an Amazon spokeswoman told ABC News in a statement. The company said safety of employees is always their top priority. "All of the impacted employees have been or are expected to be released from hospital within the next 24 hours. The safety of our employees is always our top priority and a full investigation is already underway. We’d like to thank all of the first responders who helped with today’s incident,” Amazon said in a statement Wednesday night. "Robbinsville Fire Dept on scene at Amazon Warehouse on New Canton Way investigating 'fumes' that have several employees complaining of illness. Fire Dept is attempting to isolate the source. EMTs are triaging multiple patients. 7 ambulances and a medic currently assigned," the Robbinsville Fire Department tweeted at 6:05 a.m. on Wednesday. There is no threat to residents in the area and the fumes were confined to the fulfillment center's third floor south wing, Nalbone said earlier. The warehouse is approximately 1.3 million square feet and was ventilated. "Amazon's automated robots put humans in life-threatening danger today, the effects of which could be catastrophic and the long-term effects for 80 plus workers are unknown," union president Stuart Appelbaum said in a statement. "The richest company in the world cannot continue to be let off the hook for putting hard working people's lives at risk. Our union will not back down until Amazon is held accountable for these and so many more dangerous labor practices." ABC News' Briana Montalvo contributed to this report.